Bit, our great gray barrel mare, a half sister to EASY CORD, was trained and ridden by our daughters Tam and Joy. She was a winner! She holds a record at the Nebraska State High School Rodeo Finals that still stands. 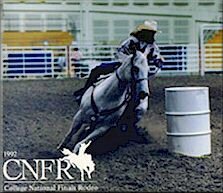 In 1992 she won the Central Rocky Mountain Region Collegiate Rodeo Circuit and was voted Barrel Horse of the Year. Bit qualified for 4 High School National Finals and 2 College Finals. She was retired to our broodmare band in 1993 and died a year later.